No doubt that the popularity of taking eye “exams” online has grown. The “one-stop shop” idea of taking your eye exam and ordering your glasses or contacts online sounds very appealing. After all, time is precious and we all need more time, right? Time savings aside, this is not the best decision for your overall eye health. First, it’s important to understand that an online eye test – even if it’s called an “online eye exam” – does not evaluate the overall health of your eyes. An online eye test allows you to check your vision between regular exams by your eye doctor. Usually, an online vision test only measures your visual acuity and refractive error. While seemingly helpful, these measurements tell little or nothing about the overall health of your eyes and whether you have conditions such as cataracts, glaucoma or macular degeneration. A comprehensive eye exam is the only way to insure your eyes are healthy and free from sight-threatening conditions! Additionally, there is no trained eye care professional present online to carefully examine the health of your eyes. 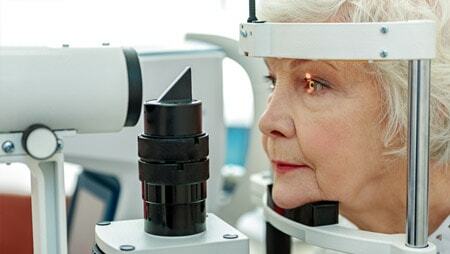 As previously mentioned, online eye exams cannot determine if you have cataracts, glaucoma, diabetic eye disease, and other general eye health problems that your doctor can detect during a comprehensive eye exam. Early detection of these problems is critical in improving treatment outcomes, potentially preventing vision loss and legal blindness. Even if your eyes are perfectly healthy, there is a greater risk of getting an incorrect prescription for eyeglasses or contact lenses with self-administered online vision tests. If you don’t take the online vision tests correctly, it’s possible you won’t be seeing as clearly as you should for driving, or you may experience problems such as headaches and eyestrain with your new glasses or contacts. And what do you do if you think your prescription might be incorrect? Do you have to retake the online vision test again? Do you have to pay for the second test, with no guarantee the new results will be any better? It’s a risk not worth taking. You might think an online eye test will save you time and money compared with the cost of a comprehensive eye exam performed by an optometrist or ophthalmologist. But remember, you are only receiving a small part of the services provided by your eye doctor during a complete exam. Also, the cost of online vision tests typically is not covered by health insurance or vision insurance. Therefore, if you have a vision benefits plan, your co-pay cost for a comprehensive eye exam might be less than the cost of an online eye test. It is essential for you to have a live, face-to-face comprehensive eye exam with your eye doctor on a routine basis to safeguard the health of your eyes and enjoy a lifetime of good vision. Online eye exams can never take the place of an eye care professional, nor will it detect serious eye conditions – no matter what age you are! Would you like to know what is covered during a comprehensive eye exam? Call Snead Eye Group today at 239.936.8686 to make an appointment with one of our eye care professionals at one of our three locations in Fort Myers and Naples. See the difference. Your eyes will thank you!